The view from Çengelköy to the Old City, framed by the First Bosphorus Bridge. Until the opening in 1973 of the First Bridge – designed by a Scotsman, Bill Brown, who had built Edinburgh’s Forth Road Bridge and lived in Bebek – the Asian shore had remained largely untouched by Istanbul’s boom and bust. It was karşısı, the “other side”, reached by boat or ferry. Despite the ensuing havoc, exacerbated by bridges two (the Fatih) and three (imminent), it still has something of the old air. The road frequently disappears behind yalıs, and it is tempting to step onto a boat and let the captain do the work. But you can also take a series of strolls, hopping in and out of buses, minibuses or taxis as you hunt for places to indulge in a little keyif – the Ottoman art of idly enjoying nature. An Istanbulkart, a widely available smart card, is essential for the buses, and small change for minibuses. The bends make a standing ride good exercise in itself. The villages still feel like real villages. And there are gorgeous places to pause. 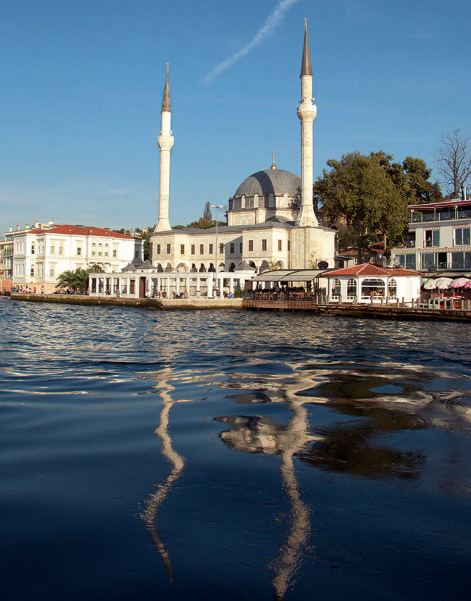 Exploring the Bosphorus is not about ticking off sights. 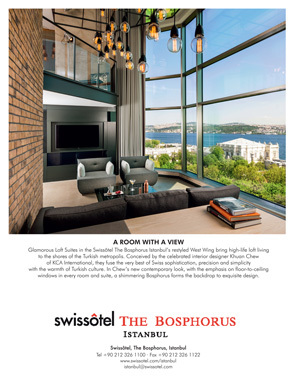 Owners of the old yalıs chose between waterside window and hilltop belvedere. Today you can do the same, just about. Beylerbeyi’s leafy hillside neighbourhood is comfortable and modern, without the genteel rakishness of Kuzguncuk, to the south of the First Bridge. While Kuzguncuk’s main street runs at right angles to the shore, so is not a busy through road, in Beylerbeyi traffic cuts off the residential side of the village from the water. But it does have a pretty harbour and a pedestrian quayside – a mini version of Ortaköy across the water – as well as the eponymous summer palace five minutes’ walk from the centre. There is also a good, if slightly run-down, hamam attached to the late-18th-century Hamid-i Evvel Camii (Hamid I Mosque) on the water. Abdülaziz’s summer palace in Beylerbeyi is gloriously unmissable. The great rectangular block may stand in the shadow of the First Bosphorus Bridge, but its formal garden is surprisingly silent, and the creamy stonework glows in the evening sun as it sets behind the minarets and domes of the Old City. This splendid pile, built between 1863 and 1865, should be your first waterside stop. Çengelköy is on a broad, sheltered bay, facing south and west, with the dreamy silhouette of the Old City on the skyline. In winter the trees hang heavy with cennet hurması (persimmons) that turn into a gooey, natural Turkish delight. The village was always ramshackle, but it had rustic charm. Even a decade ago, country lanes led over the hills between cypress groves, bubbling springs and drystone dykes. A few of these secret paradises can still be found between Çengelköy and the Rasathane (Observatory) above Vaniköy, though a new presidential compound has seen the crude rebuilding of the whimsical hilltop köşk of the last sultan, Vahdettin. Çengelköy’s glory is its yalıs. Don’t look too closely at the Bostancıbaşı Yalı, now a pudding shop. It was ruined by restorers in the 1980s and rebuilt in concrete – the beauty of these wooden structures resides in their very frailty. Stand on the pier beside it to admire its neighbour instead. The Sadullah Pasha Yalı, the archetypal 18th-century seaside house, is the real thing, even if its late owner, Emel Esin, a scholar of Turkic heritage, took theory a little too far, stripping away the wings to leave only the selamlık, the essential Central Asian “tent”. First hopping-off point after Çengelköy is the quay of Kuleli, just upstream from the hotel Sumahan on the Water. The Kuleli Military High School is a striking piece of mildly Habsburg architecture with a fine vantage point, a heavenly spot for some fishing. With its distinctive turrets, Neoclassical portico and a fresh coat of paint, it is the most handsome public building on the Bosphorus. Its name, from kule (tower), refers not to the 19th-century turrets but to the tower of a 6th-century Byzantine monastery, originally a refuge for prostitutes called Metanoia (Repentance) set up by Theodora, Emperor Justinian’s wife, herself a former courtesan. Anadoluhisarı has a modern cosmopolitan glamour and buzzes in the evening amid the vapour of a thousand electronic cigarettes (writes Harriet Rix). The most important people to know, however, are not the trendy barmen or the chef at the fish restaurant just below the fortress itself, but members of the small boatmen’s cooperative, who will take you across to Rumelihisarı and back, or up and down the stretch of yalıs either side of Anadoluhisarı, in their small boats. Turn left down the cobbled street towards the Göksu river, just before the fortress wall cuts across the road. The boatmen will be sitting waiting in the shade, drinking tea.